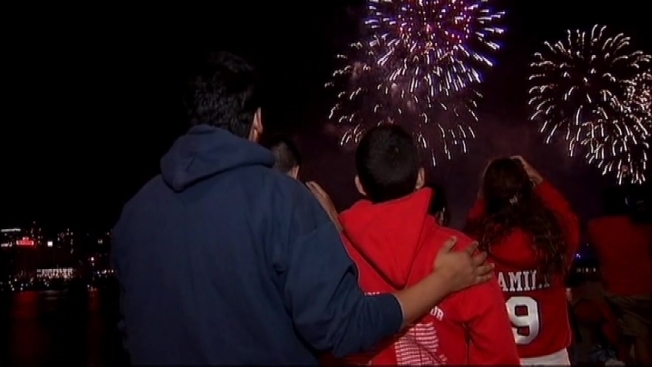 Crowds gathered by the East River for fireworks Friday evening, the first time in five years that the Macy's 4th of July Fireworks Spectacular in New York City was not over the Hudson River on the West Side. A brilliant 25-minute show of reds, whites and blues lit up the sky from three barges on the East River, sandwiched between Brooklyn and lower Manhattan--and even some from the iconic Brooklyn Bridge itself. Macy's says more than 1,600 shells were launched per minute during the 25-minute display over the East River. It's the nation's largest Fourth of July fireworks celebration. An estimated 3 million people were expected to gather for the show, according to Macy's. Skies had cleared as a weakened Hurricane Arthur continued to churn north North, having brought with it periods of rain earlier in the day. The show, which will was centered near the Brooklyn Bridge, took place slightly further south than originally planned because a barge was repositioned due to a rip current following the rainy weather, Macy's said.